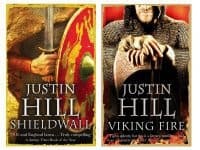 For this, the last in my Spring series of 'fab historical writers' features, I'm delighted to welcome Justin Hill to my blog. I met Justin several times last year at various spirited battle re-enactments around the 900th anniversary of 1066. His latest novel Viking Fire is about Harald Hardrada, hero of my own novel The Constant Queen which came out at almost the same time so it was wonderful to discuss our favourite Viking and to consider our different versions of his story. My novel centres around Harald's wife Elizaveta and is a more 'girlie' take on his life but both of us love Harald for his ambition and fire and both of us feel strongly that his is a story that has gone too long untold. I hope readers of either book will agree. 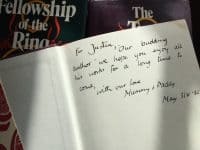 Justin did not start out writing about 1066, though his first historical novel, Passing Under Heaven, is set in China in the Tang Dynasty which is roughly contemporary to the Anglo Saxon Period. It was inspired by the story of a female poet who was writing feminist poetry in the 9th century. The Tang Dynasty was unlike our imagination of China. The capital city, Xian, was in many ways the New York or London of its age. It was a time of artistic flowering and a time of unequalled freedoms for women in China, not to be repeated until the 20th Century. A woman could be independent as a Taoist priestess, concubine or courtesan and the poet in question, Yu Xuanji, managed to combine all three roles in a short life. When I was little I used to want to be a fireman, and then it all changed when I was ten years old. I was in the rudimentary reading class, and I didn’t like books. Then the boy next to me was reading a book called The Hobbit and it looked interesting, so I gave it a go, and loved it and went straight into The Lord of the Rings. I read the three books, the appendixes, everything – and I still remember the feeling of loss as I closed the book and the spell ended - the world, the people, their struggles had all felt so real for so long – and as it came to an end I felt a tug of grief and loss. I remember thinking ‘I want to do that.’ To summon up worlds that felt real. So I decided, without knowing anything about it, that I wanted to be a writer. The start of a novel is so full of promise and possibility… It’s a fairly intense experience. I get a vision of what I want, a bit like St Paul with his Road to Damascus moment, and I get hugely inspired and excited about the story ahead. It’s like a new lover. The possibilities are endless. Half way through, when the novel is frustrating me and I don’t know how to make it work; and I feel like I have forgotten how to write. It feels very real at the time, but I’ve been through it enough now to know it’s a phase my books go through. And that it’s part of making the story better, the characters more real, the pace more gripping. Why were you drawn to the pre-1066 period? I’ve always loved the Anglo Saxon and Viking period. I grew up in York and it was hard not to identify with the Norse part of our history and heritage. Hastings is also one of our great national myths and tends to be recounted in simplistic pro-Norman or pro-Saxon tropes. I thought the story deserved something more realistic and interesting. Yes! Ancient Greek history is very appealing in terms of setting and language, although as a fan of Mary Renault, it would be hard to match her stories. But I’ve a few ideas that I’m mulling over. 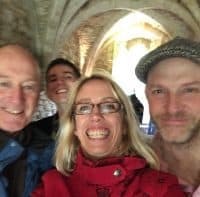 Me (looking a bit mad) with Justin, James Aitcheson and Glynn Holloway at the Battle of Hastings re-enactment last year. 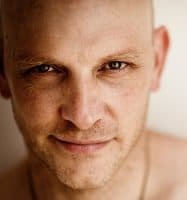 If you'd like to find out more about Justin's books, you can find him on his website, follow him on twitter and facebook, or subscribe to his mailing list. all comments welcome below or on my own facebook page. Thanks so much. I do it myself through WordPress – with a bit of help sometimes when it gets too technical for me! I’m very glad you enjoy the blog.